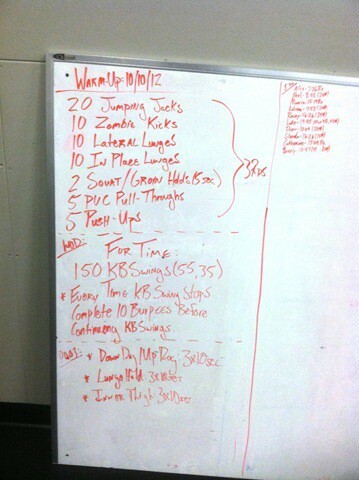 Since I’m sicker than the monkey caretaker on Outbreak, I thought I would share workout from 2 weeks ago. It’s been a couple of weeks since we got into the new gym, but here are a couple of pictures from the first morning workout. The new space is fantastic! I’m amazed at how quickly this whole switch happened. One month, everyone is fighting the new businesses and new traffic at the old gym and within a few weeks, we are pulling into our own building and parking lot. We no longer have to share the parking lot with about 7 other stores including a new bank on the corner which cut our parking in half. What I love best is of course, the CrossFit box. It is indeed a box. These are from the first morning, so most of our equipment is still in storage. 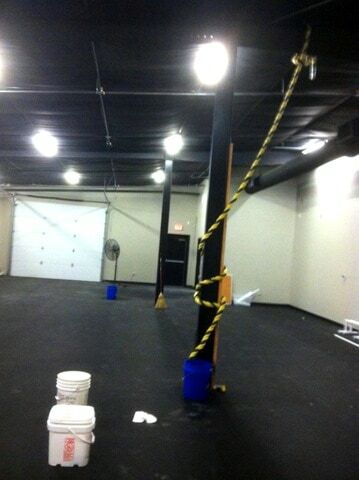 We will have rows up pull up bars, the weights, ropes, boxes, etc. The Universal “monkey bar” system will be set up outside so we can combine a lot more variety into an outdoor WOD. The pull up bars will hang along the right wall from those pipes. The floor is that rubber stuff used for weight lifting rooms. I think it does double duty to protect those of us who can trip over air. So much more room. This is the 5:30am crew. They had the clock and the whiteboard set up. 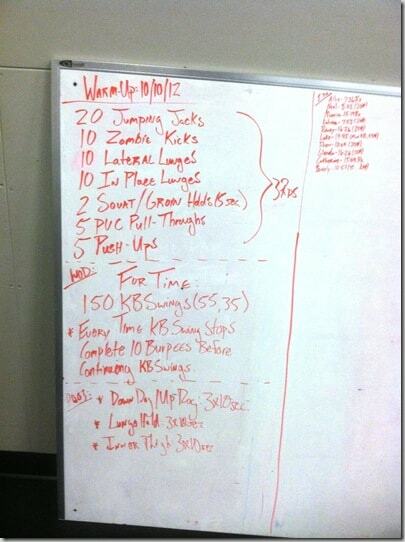 That was all we needed to get in a good WOD. 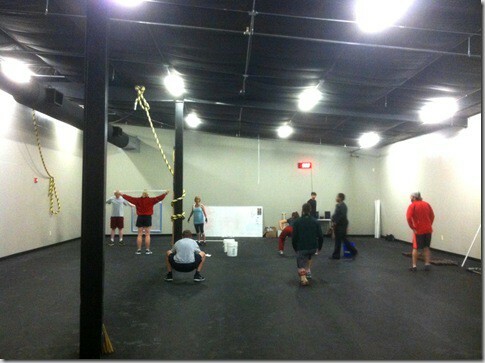 First WOD in new gym! So there are the first few pics! Contrary to poplar belief, we do not talk like this guy. But huge thanks to Planet Fitness for warning me that people who want to lift heavy need not apply…. The new ladies’ locker room. 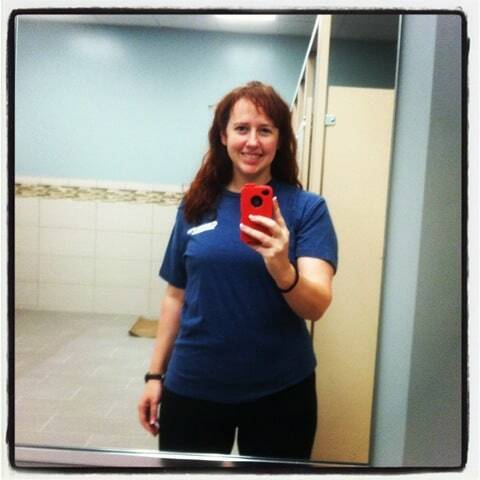 Also the first time I fit in my crossfit shirt since I got it. 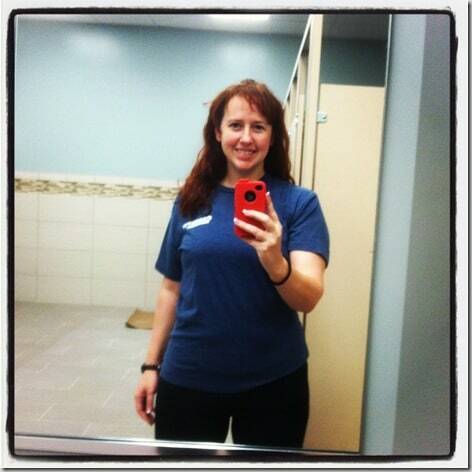 19 lbs gone since going gluten-free. A few more to go until I feel back to running/racing weight. 🙂 The weight literally fell off over the course of 3 weeks. Gluten=inflammation=swelling Michelin man EVERYWHERE. Even my elbows were puffy. I got that hair piled on my head in my typical Pebbles look for 5:30 and got the workout done! As far as the shower facilities, I was happy to see that we had great shower pressure. It’s not laughing matter when the water pressure is a trickle. The old gym had better pressure than my house. And this gym is just the same. We have a lot more mirrors and electrical outlets which we desperately needed. Vanity aside, I will not leave the gym with wet hair in the winter. I believe my relatives when they told me that wet hair in cold weather will cause pneumonia. I don’t care how many studies or research papers disprove this. I believe it. Makeup can be left in the bag, but I must have time and space for the hair dryer. As we get settled in and get more of the smaller details—like curtains to make an actual dressing space—the place will become like home again. It was great to see the usual morning people after a 2 week break. 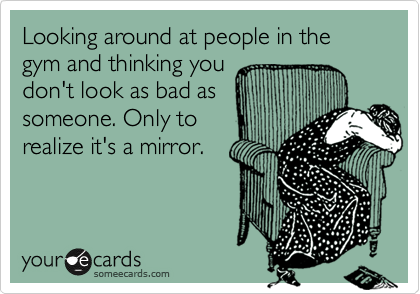 And it’s good to get back into my routine so I’m not disillusioned by my own reflection……sigh. After checking out a handful of the blog articlees on your website, I seriously like your way of blogging. be checking back in the near future. Please check oout my website as well and let me know what you think. makes people want more? I mean New gym! is kinda plain.